Who can use Vedic Astrology ? Vedic Astrology Software Free ! The positions of all these planets, upagrahas, lagna and special lagnas in the zodiac are measured in degrees, minutes and seconds from the start of the zodiac (which is a fixed point in the sky). These positions are measured as seen from earth and they are called “geocentric positions". For the positions (calculated in degrees, minutes and seconds) of planets, lagna, special lagnas and upagrahas, we also use the words longitude and sphuta. When watched from earth, the longitude of any planet in the skies can be from 00'0'' (0 degrees 0 minutes 0 seconds) to 35959'59''. It should be noted that 00'0'' corresponds to the beginning of the zodiac. 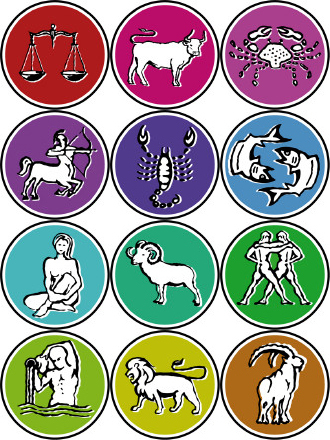 Many western astrologers consider Sayana or tropical (moving) zodiac, whereas Nirayana or sidereal (fixed) zodiac is considered in Vedic astrology. The zodiac (sky) lasts 360 as mentioned above and it is divided into 12 equal parts. They are called “rasis” (signs). English names, Sanskrit names, two-letter symbols and values of the start longitude and the end longitude (in degrees, minutes and seconds) of all twelve rasis are given in Table 1. If a planet is at 22137', then you can find from Table 1 that it is between 2100'0'' and 23959'59''. So, that planet is in Scorpio (or Vrischika). Its advancement from the start of the rasi occupied by is 1137'. Its position in the zodiac (22137') is shown by some people by the notation 1137' in Sc or simply 11 Sc 37. This means “advanced by 1137' from the start of Sc (Scorpio)". Some people show it as 7s 11 37'. This means “after completing 7 signs, advanced by 1137' in the 8th sign (which is Scorpio)". Each rasi again has many kinds of divisions and they are called “vargas". They will be defined in detail later.